Storage components consist of the cylinder assembly(s), which contains the Novec 1230 fluid, and the cylinder bracket(s), which holds the cylinder assembly securely in place. 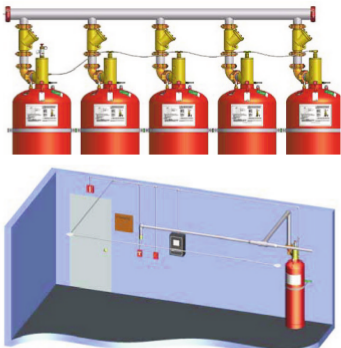 Distribution components consist of the discharge nozzles used to introduce the Novec 1230 fluid into a protected hazard along with the associated piping system used to connect the nozzles to the cylinder assembly. Trim components complete the installation of the suppression system and consist of connection fittings, pressure gauge, low-pressure supervisory switch, electric valve actuator, and manual valve actuator. Slave arrangement components consist of the pneumatic valve actuator(s), actuation check valve, vent check, actuation hose, and fittings required for a multiple cylinder (slave) arrangement. This device monitors the condition of the electric actuator, detectors, warning devices, cylinder pressure, and any manual release and abort stations. All electric or electronic devices must connect to the control panel in order to function. Detection devices coupled with manual release and abort stations maximize system efficiency while audible and visual alarm devices alert staff of alarm conditions.